Offering you a complete choice of products which include programmable temperature chamber, bench top uv accelerated weathering tester (touch screen), fume hood, accelerated aging oven, xenon test chamber pspl 866 and xenon testing chamber pspl 867. Programmable Temperature & Humidity Test Chamber PTH225 is designed to create targeted environment/climatic conditions meant to test materials, components, and products for reliability and endurance. Allow faster and accurate behaviour evaluation of the product in controlled climate conditions. Machine design and structure complies with global testing standards. 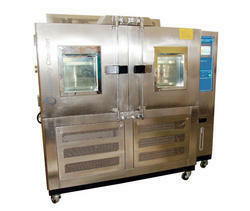 Can test a wide range of product, material and component for humidity and temperature effects. High-tech technological features allow easy and smooth operations. Advanced Touchscreen display to set testing parameters and values without any hassle. Live running test values and changes in parameters can be viewed on display. Temperature and cycle graph can be obtained on screen with details. Internal space- WxDxH= 600x500x750mm, 225 Lit. The polymers and elastomers have to bear a lot of pressure due to their extended exposure to open environments. The environmental factors such as pollution, dust, moisture, Ultraviolet, heat etc. have a bad effect on the quality and durability of the products. The manufacturers have a great challenge to make their products enduring enough so that they could withstand these effects in a better way so that their products could last long and perform in a superior way in actual working condition. To enhance the quality of the products, first, the manufacturers need to test the effects of the environmental factors on the properties of the products and materials so that they can make essential changes to the manufacturing processes to enhance the quality of the products. The Benchtop UV accelerated weathering tester is an ideal instrument for quick, easy assessment of the effects of weathering on the quality of the products. It is an effective and simple testing instrument which can easily replicate the actual working conditions to which the products are subjected to give an idea what would change in their properties. The instrument is a must-have in any industry where polymeric or elastomeric products are manufactured. The equipment needs a power supply of 220V/ 50 Hz. The temperature range that can be set in the instrument is ±5ºC ~ 80ºC. The timing range of the instrument is easily settable from 1 hour to 99999 hours. The spray timing of the equipment can easily be adjusted from 1 minute to 99999 minutes. The lamp of the instrument has a rated life of 1600 hours. The maximum irradiance that can be obtained from the instrument is 0.7 W/m2. The flow of water from the water pump ≤ 7 litres per minute. The instrument is incorporates a slowly and uniformly rotating sample rack that allows uniform exposure of the samples to the irradiance. It is a very low power consuming instrument. The equipment simulated the natural environmental conditions with great accuracy. The equipment comes with a very low maintenance cost and hence is an economic way of material and product testing. The instrument is rust proof as the components are made from high grade stainless steel. The instrument strictly follows all the guidelines stated in various national and international standards. Laboratory fume hoods are designed to protect laboratory personnel by preventing contaminants such as chemical vapors, dust, mists and fumes from escaping into the laboratory environment. Laboratory fume hoods also provide lab personnel with a physical barrier to chemicals and their reactions. 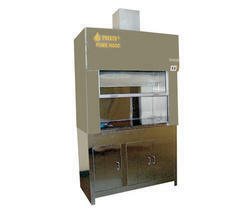 Fume hoods are evaluated each year to verify their proper operation. They are generally set back against the walls to cover up the exhaust ductwork. Because of their shape, they are generally dim inside but have a provision for a light source. The front opening is made up of glass, able to move up and down on a counterbalance mechanism. Fumes are completely eradicated from the workplace. Thick glass covers in front for quiet and safe operation. Excellent chemical resistance and high-performance air flow control. Quiet operation, because of the extract fan being some distance from the operator. 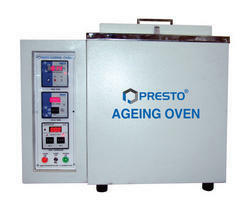 Accelerated Ageing Oven ageing and heat resistance tests are designed to estimate the relative resistance of rubber to deterioration with the passage of time. For this purpose, the rubber is subjected to controlled deteriorating influences for definite periods, after which appropriate properties are measured and compared with the corresponding properties of the unaged rubber.In accelerated ageing, the rubber is subjected to a test environment intended to produce the effect of natural ageing in a shorter time. 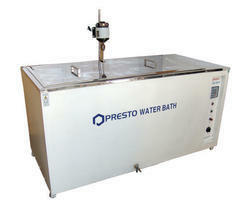 Presto offers different types of environmental testing instruments to create actual weather conditions of various kinds. 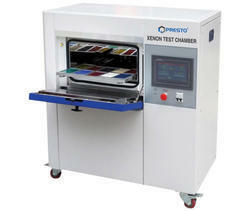 One of the best environmental test equipment introduced by Presto is Xenon 866. The test equipment helps to examine the weather resistance of polymers when placed under different climatic conditions that are created in the laboratories. It is the highly cost-effective method which is used to measure the quality of the polymers. Adjustable testing temperature range- RT+30? ~ 80? The accelerated weathering test provides two sources of lights namely Xenon lamp and Fluorescent UV lamp. Fluorescent UV lamps are used to create the ultraviolet part of full sunshine; hence it is comparatively difficult to get the reliable testing results all the time when samples are exposed. Additionally, the xenon lamps are used to evaluate the actual life of the polymers as these lamps offer higher feasibility. These lamps are completely filled with Xenon and send the lights because of xenon discharge. A xenon lamp offers stable spectrum distribution and provides an output in the form of steady light energy. 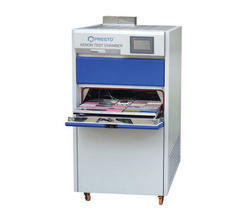 The testing machine provides highly accurate and reliable test results. The machine is provided with a user manual and a compliance certificate that are perceptible to NABL approved labs. The instrument strictly adheres to various national and international standard test methods that are provided by different standardization authorities. Adjustable Irradiance range- 0.5~ 2.0 W/m2(Single point of control: 340nm),0.35~ 1.0 W/m2(Single point of control: 420nm),50 W/m2~ 120 W/m2(Full spectrum :from 300 ~ 400nm). 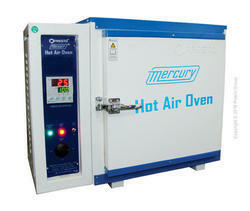 Hot Air Oven is a unique test cabinet designed to detect the change in the physical characteristics of material and to ascertain the actual working life of testing device at elevated temperature. Water Bath Digital is a unique test cabinet designed to detect the change in the physical characteristics of the material and to ascertain the actual working life of test samples at elevated temperature. Available in Digital PID Temperature Control Models with Timer facility (optional) with various capacities. Heater Wattage- 3 Kw x 3 nos. 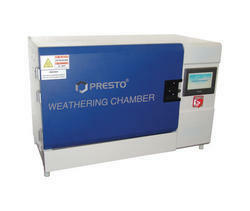 Looking for Environmental Chambers ?